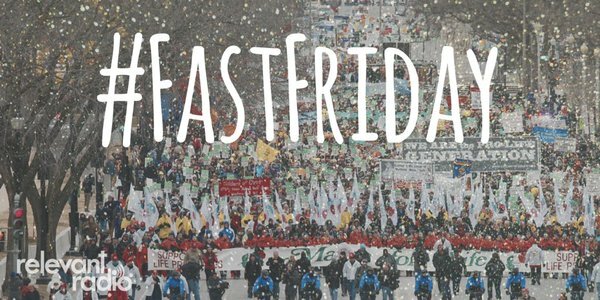 Home Blog #FASTFRIDAY in Solidarity with March for Life! #FASTFRIDAY in Solidarity with March for Life! How will you participate in the March for Life this Friday, January 22? Will you be one of the thousands marching in Washington DC or in one of the local marches across the country? If not, sulk not. You still can participate in the March for Life! This morning, I had a spirit-filled conversation with hosts John Harper and Glen Lewerenz on Relevant Radio’s Morning Air Show. We chatted about the mutual disappointment of those of us who can’t physically march in the March for Life. We sure wish we could be there, but for various reasons, we can’t. Perhaps, but we still can participate. We’ve devised a way to participate physically and most importantly, spiritually, right from wherever we are. This Friday, John, Glen, and myself are going to fast as a symbol of our solidarity with the marchers and as our spiritual contribution to the Pro-Life Movement. We absolutely must take a visible stand for life. We need activists, lawmakers, counselors, teachers, health care providers, students, clergy, religious – basically folks from every walk of life (no pun intended) – to do what is right and godly and to protect life from conception to natural death. At the same time, we also need the “quiet” ones. We need those who may not be able to march in DC or anywhere for that matter, but who can offer earnest sacrifice and ardent prayer. In the end, that is what will work the miracles of transformation that will turn hearts and minds toward life. Along with the Morning Air Family, I’m inviting you to join our #FASTFRIDAY campaign. Our Lord set the example for us, by himself fasting. He also taught us that prayer and fasting are the most effective weapons against the forces of evil (see Mt 4:1-11) and that some demons can only be driven out in this way (see Mk 9:29). In the Gospel of Life, St. Pope John Paul II specifically mentioned fasting as means to end the pro-death culture. Let us therefore discover anew the humility and the courage to pray and fast so that power from on high will break down the walls of lies and deceit: the walls which conceal from the sight of so many of our brothers and sisters the evil of practices and laws which are hostile to life. May this same power turn their hearts to resolutions and goals inspired by the civilization of life and love” [Pope John Paul II, Evangelium Vitae, 100]. The anti-life mindset can sometimes seem like an insurmountable adversary. But we can’t let ourselves become disheartened. “Many are easily hemmed in by a few; in the sight of Heaven there is no difference between deliverance by many or by few; for victory in war does not depend upon the size of the army, but on strength that comes from Heaven,” we read in Maccabees (1 Mc 3:18-19). Join us in fasting this Friday, January 22, in petition to end the atrocity of abortion and turn the tides toward a culture that will respect, love, and support life. Share this post and use the #FastFriday hashtag on your social media. Let’s go viral with this initiative, and get as many folks on board #FASTFRIDAY as possible. Solidarity! Thank you Lord Jesus!! !